Beautiful 3 bd, 2 1/2 bath, loft, family, living, dining, built-in library, 1 car-carage, paved parking for 7 cars, 8 security cameras, brand new tigerwood flooring, gym, swimming pool, playground, security 24/7, non-smoking, no pets. Washer and Dryer. Internet, Cable, and Alarm included. Corner house with spacious green area. Landscaping included. Close to the Air Force Reserve base. Close to A+ Elementary school, Walmart, Fresco, and many others. Close to Miami Dade College-Homestead. Criminal background and credit history will be checked. Mortgage calculator helps you to calculate your monthly mortgage payments. Your message has been successfully delivered. 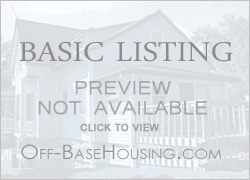 Check out this property I found on Off-BaseHousing.com©.